Here's the sketch Challenge that Cards N Things has for this week. I found it particularly a challenge since 1) i never do sqaures on a card, since my ability for squares is found with punches, and 2) I didn't have a idea of what type of card to make. After sitting in my craft cave for a while I thought of two things I never seem to have - masuline cards & graduation. What a challenge! But I made it and I am quite happy with the turn out. I used Burgundy CS as my base, since I overlook this color most of the time. I used the SU Texture Polka dots plate on the Sahara CS, which isn't visible here but IRL it is. 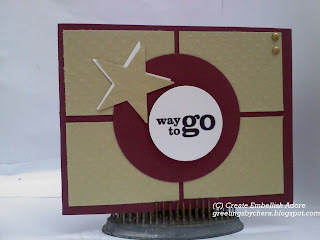 I used the WAY TO GO from the "Starring you" stamp set, perfect for the card. My gold brads are so under used, and though I would have liked to use something else, this just seemed to put the touches on the card. Starring You is one of the catalog sets you can get for FREE, during the Sale a bration period (which is now thru March 31), when spending $50. 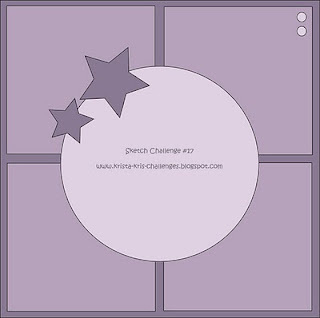 You did a great job with the challenge Chera ! Great card ! Thanks for playing along ! !